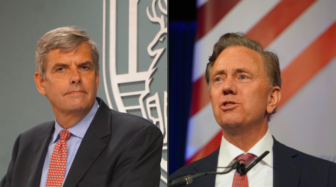 Democratic gubernatorial nominee Ned Lamont challenged his Republican rival, Bob Stefanowski, on Friday to participate in a Sept. 5 debate at the University of St. Joseph in West Hartford. A spokesman for the Stefanowski campaign could not be reached for comment Friday afternoon. The income tax, which supports 51 percent of the state’s General Fund, could not be eliminated, Lamont has said, even were the state to gut resources for education and municipal aid. “After decades of failures by Democratic and Republican politicians in Hartford, the people of Connecticut deserve someone who will tell them the truth and lead Connecticut to a 21st century economy,” he added. The debate will be hosted by Fox61, WNPR, the Connecticut Conference of Independent Colleges, and The Connecticut Mirror.